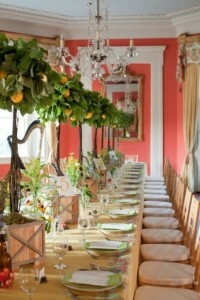 Fruits and vegetables lend an elegant touch to entertaining and decorating for social events. 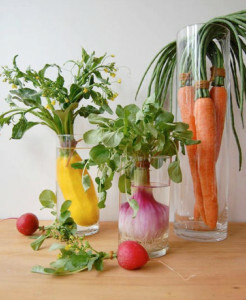 The beauty of vegetables and fruits does not need to be tucked into a back corner of your yard but interspersed throughout flower beds and shrub borders to be gazed upon. Leafy vegetables such as radishes, lettuce and low-growing herbs can be used as edible edges in flower beds or as textural interest in containers. 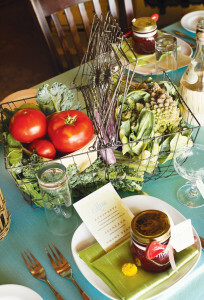 Fences, trellises and posts can be adorned with vining vegetables. 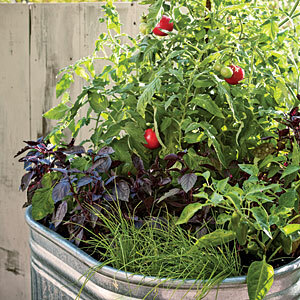 Many vegetables are available as bush-types for use in containers and small spaces. Peppers and eggplant have beautiful leaves and fruit that mix well among flowers. Raspberries make a great hedge, strawberries a fine ground cover and cherry tomatoes can vine up a trellis. Experiment with this new approach a little each year and soon you will forget to banish all vegetables to one area of your garden. Now that these ornamental vegetables are interspersed throughout your flowers and shrubs you will surely be tempted to harvest them. By simply including more fruits and vegetables in your life, your body will be healthier and your diet will be more varied and interesting. A diet rich in fruits and vegetables promotes immune health, reduces the risk of heart disease, stroke and diabetes, can lower blood pressure, help prevent cancer and kidney stones, and help reduce your waistline. Fruits and vegetables are naturally low in calories and filled with the vitamins, nutrients and fiber that your body needs to stay healthy and fight off disease. Eating more vegetables and fruits, especially if you grow your own, helps out the wallet too. When you learn to grow your own food and encourage others to do the same you are taking power over your diet, health and wallet. Enjoy their ornamental beauty in the front of your house and you will surely add more of them in your diet.